Comics Twitter is a JERK! - Honk if you love justice! Browse: Home / 2016 / October / 28 / Comics Twitter is a JERK! 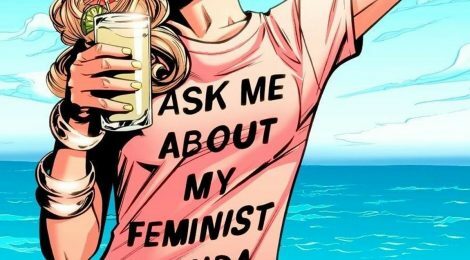 Subtitled “Ask me about MY feminist agenda”. The thing about this whole mess I don’t get is, why do the misogynist man-babies get so wound up about a book they didn’t read? They are gleefully vile in attacking Chelsea Cain after the cancellation of the Mockingbird series, and the preview of Joelle Jones’s cover to Mockingbird #8 seen in part above. Why? Why are they so threatened by the idea of a comic book series not directly aimed at them? I’m late to Mockingbird, mostly because I didn’t have a ton of cash for comics over the past year or so, but I’ve read it up as the issues have hit Marvel Unlimited and it’s quite a bit of fun, enough that I’m going to get the trades. The thing is, if I hadn’t liked it I could just…not read it. Even if I had bought the first issue, and not liked it, I’m out, like $4. I could MOVE ON and not make my whole life about the fact that a woman wrote (or drew or colored or lettered) a comic that was not specifically targeted to me. The fact that Hellcat exists doesn’t actually stop me from reading Iron Man or Batman. Your local comic shop isn’t going to smack that issue of Superman out of your hand, rip a five-spot from your wallet, and stuff an issue of Lumberjanes in your bag whether you want it or not. Look, I guarantee comic companies don’t want to replace your manly comics with feminist ones, they want to sell BOTH. They will make more of whatever sells. Marvel would put out 100 books a week if they all sold 50k copies. They don’t, so some books go on, and some get cancelled. Mockingbird didn’t find an audience, but the correct response shouldn’t be to crow about it and harass the creators behind it beyond all reasonable endurance. You should be celebrating that a company is willing to try something different than just another comic about a white guy punching bad guys because his parents died. There is no excuse for what happened to Chelsea Cain, or any other person who has been chased off or had vile insults and threats leveled at them for the ‘crime’ of doing something in a formerly male-dominated space. Don’t give in to the impulse to gatekeep ‘others’ out of your hobby, and seriously, don’t take your hobby so seriously that you think abusing strangers is a good idea. I get really tired of being a part of fandoms that act like this (I’m a gamer too). I plan to be a better ally, and so should you. Go ahead, step outside your comfort zone. You may just be glad you did.